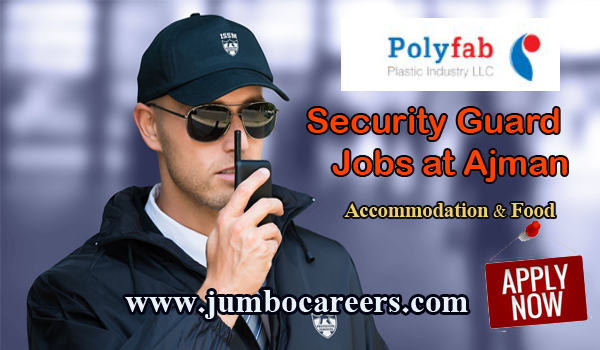 A leading Plastic Pipe manufacturing company in Ajman requires experienced security guard. Benefits include Free accommodation+ food+ medical insurance. About the Company : Polyfab Plastic Industry LLC was established in 2005, at UAE with major offices in Dubai, Abu Dhabi and Ajman. They are experts in high quality, technologically advance plastic piping. Their plastic piping manufacturing methods, follow rigorous quality control; assurance policies supported by certificates from top international testing and certifying bodies. The company has a strong rooted ethos of Quality and Prudence. They always believe that Trust & Commitment are more important than mere Success. UAE experienced security guard required for a reputed manufacturing company in Ajman. Should be well built, healthy, able to work on shifts, and should be disciplined. AED 1500 salary + free accommodation+ food+ medical+ other benefits provided. How to Apply Security Guard Jobs at Ajman . Latest Security Guard Jobs at Ajman.